Dr. Zhao joined the Wellman Center in 2008 with over 20 years of experience in multidisciplinary research and development obtained from both academia and industry. Dr. Zhao received her M.D. in China and Ph.D. from the University of Montreal. Prior to joining the Wellman Center, Dr. Zhao held positions as research investigator, principal scientist, and associate director in industry, where she gained extensive research and development experiences, including development of several proprietary clinical diagnostic tests. She also held positions of instructor and senior scientist at the Harvard Medical School and the Howard Hughes Medical Institute, respectively, after pursuing her post-doctoral training at McGill University and Harvard Medical School. Her diversified research experience covers histopathology, physiology, immunology, molecular biology, oncology, endocrinology, and genetics. 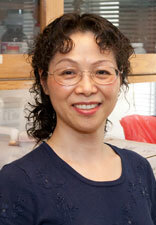 Her expertise over a wide range of instruments includes confocal imaging system, microscopes (bright-field and fluorescence) and digital imaging system (including live time cell imaging), whole slide scanner, flow cytometry systems, Luminex systems, and automated analyzers (Access II Immunoassay System, ACL Advance). Her contributions to research have yielded several high-quality peer-reviewed publications, including one first author paper published in Cell. Her role as the director of this core is to build a strong and advanced core facility to providing the best core services, to direct the core facility administratively and technically/scientifically, to guarantee the smooth operation of the core facilities and quality controls, to maintain instruments, troubleshoot, ensure quality control, train researchers to use advanced equipments, oversee data acquisition, data analyses, and data management, as well as help and advise researchers on their research project needs, including experimental design, methods development, and protocol implementation.